It has been a very exciting week for space exploration with the pictures sent from New Horizons as it flew past Pluto on Tuesday. Monday next week (20-th July) marks the 46-th anniversary of the first landing on men on the Moon, which was one of the iconic events of the last century. To celebrate this anniversary I have decided to re-blog my post from July last year marking this momentous occasion. The first man in space, Yuri Gagarin, in April 1961. By achieving this goal of landing a man on the moon, which was incredibly ambitious given that in May 1961 America had not yet place a man in orbit, the United States would show to the whole world that it had gained supremacy over the Soviet Union in space exploration. 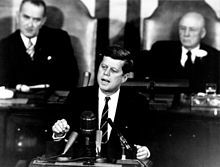 The Moon is our nearest neighbour in space, and Kennedy was advised that, given sufficient investment by the richest country in the world, a manned landing could be be achieved before 1970. There was also a good chance that, given the amount of resources needed to develop and test the new technologies needed, the Soviets would not be able to do it by this date. The Soviet Union simply could not afford to spend so much money in such a short time. To achieve Kennedy’s goal, the American government funded the largest commitment every undertaken by a nation in peacetime. At its peak the programme employed nearly half a million people and its total cost (in 2016 dollars) was around $175 billion. The event was shown on live TV to a worldwide audience of over 1 billion, almost a third of the population of the Earth at that time. As a young child I was one of those billion people but not Mrs Geek, as it was past her bedtime (she was five years old). 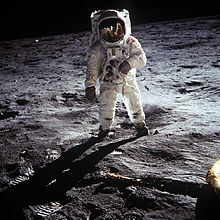 In total the astronauts spent 2.5 hours on the lunar surface, during which time they gathered around 25 kg of moon rock. These samples would be studied by scientists over the forthcoming years and would provide new insights into the origin of the Moon. They left behind on the Moon’s surface scientific instruments that included an array of mirrors used to calculate the distance between the Moon and the Earth, and a seismometer used to measure moon quakes. 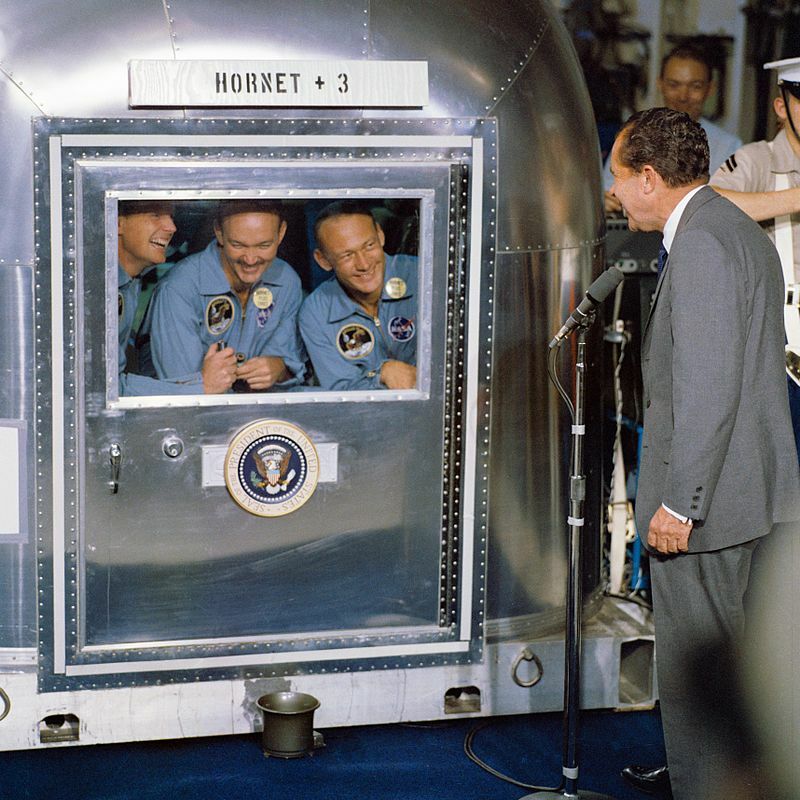 On their return to Earth, the astronauts were treated as heroes – but they also had to spend three weeks in quarantine, just in case they had picked up any strange and potentially dangerous diseases on in the Moon. After they had emerged from quarantine they went on a world tour in September and October 1969, and met many prominent leaders, such as Queen Elizabeth II. 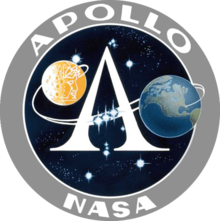 After Apollo 11 there were five further successful missions to the Moon (Apollos 12,14, 15, 16 and 17) plus one unsuccessful mission Apollo 13, which you may well know about from the Hollywood movie of the same name. 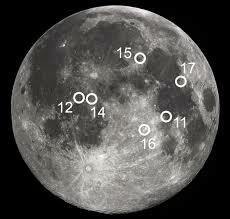 The diagram below shows all the Apollo landing sites. All the landings were on the near side, as it would have been far too risky to land on the far side of the Moon, where they would have been out of direct contact from the Earth. The later missions involved the astronauts having progressively longer and longer stays on the Moon. For the final mission, Apollo 17, the astronauts stayed on the surface for three days and performed three separate moonwalks. 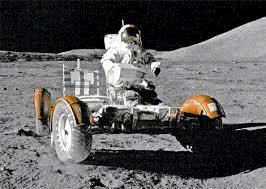 During the final three missions the astronauts used an electric-powered moon buggy to allow them to travel longer distances on the Moon – about twenty miles away from the lunar module – and thus gather rock samples from more varied sites. After the successful landing of Apollo 11, watched by such a huge proportion of Earth’s inhabitants, public interest in the Moon program started to wane and the US government quickly came under pressure to reduce the spending on manned space exploration. The last three Apollo missions which should have taken place in 1973 and 1974 were cancelled. Another victim of the spending cuts was the Moon base, which NASA had been hoping to build on the Moon in around 1980. This Moon base would gradually be extended, over the following years and decades, until it became a fully fledged lunar colony. The intention was that one day people would actually live on the Moon, but these plans were brought to a halt in the early 1970s, purely because of the cost. Not only that, but for the last 43 years no astronaut has ventured more than a few hundred miles above the surface of the Earth. When will humans next go to the moon ? I think it is unlikely that the next astronauts to set foot on the Moon will be from America. NASA has no plans to go to the Moon within the next decade, because there is little political will or drive to do it. It is unlikely that Congress would provide the funding, especially as NASA is already committed to supporting the International Space Station until at least 2020, which will reduce the money available for other manned space missions. I think the next humans to set foot on the Moon will be from China, in around the year 2025. China has its own ambitious manned space programme, and has recently landed an unmanned probe on the Moon, which is exploring the Moon as I am writing this post. In fact, there is so much to say about Chinese plans to explore space that I dealt with this in a separate post “Chinese Manned Spaceflight”. The way the public and politicians turned their backs on space after that first moon landing was predictable in hindsight. It was sold as a race. There was a winner. That was it. On the other hand it’s difficult to think of a way the Apollo program could have gained popular traction otherwise at the time. Very true, the space race to be first country to land a man on the moon had more to do with cold war politics than scientific exploration. I too was in bed asleep when that momentous moon landing happened as I was 4 years old. Remember it well. I was 7 (going on 8!) years old at the time. Just wish I knew what my 75 year old Grandfather thought about it. You still hear the occasional Moon Landing Hoax believer ramble on. I think they have secret meetings with The Flat Earth Society. I don’t know where I was. I was -1. I really ought to ask my parents about their memories of it. I rushed home to watch it all on TV – with my parents. You have definitely done this anniversary justice. Would have loved to have seen it! Now we have finally even photographed Pluto…..wonderful. It was one of those great events of the twentieth century. Although I was a very young child at the time it still stick in my memory as one of those events that brought the world together. Now pluto seems like a momentous event to the youth and everyone else in the world. The girls are really enjoying your blog. Take care.